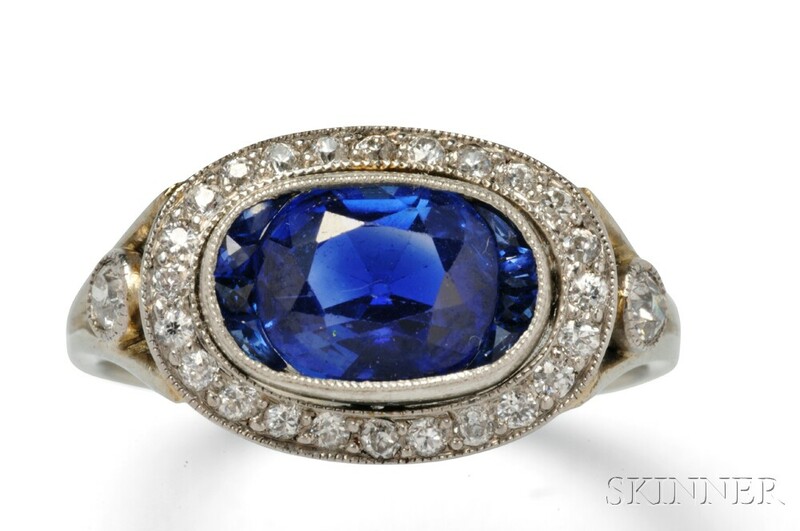 Art Deco Platinum, Sapphire, and Diamond Ring, centering a bezel-set oval mixed-cut sapphire measuring 7.95 x 6.60 x 5.18 mm, flanked by calibre-cut sapphires, surrounded by old European-cut diamond melee, size 6. Note: Accompanied by AGL report #CS70460, dated October 2, 2015, stating that the sapphire shows no evidence of heat or clarity enhancement, origin Kashmir. Approx. 2.19 cts by formula. 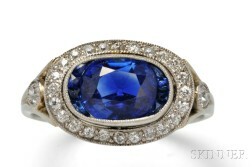 Minor facet wear, and minor facet wear to side sapphires. Clean under magnification.